Not much has changed since the showcar was unveiled at Frankfurt last September. Believe it or not, it’s been eight months since the awe-inspiring Mercedes-AMG Project One hypercar was . 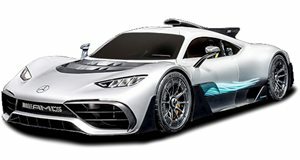 Billed as an F1 car with the road, the Project One promises to be the most extreme road car Mercedes-AMG has ever built, combining a turbocharged 1.6-liter V6 with four electric motors to deliver an output of over 1,000 horsepower. Since the showcar debuted at Frankfurt we’ve seen very little of the hybrid hypercar, but a production version was recently spotted in Monaco. Photos posted by the_luxurious_cars on caught the Project One partially covered while being transported on a truck. Presumably, it was being shown at a private event at last weekend’s Monaco Grand Prix to future owners, because the Project One has been sold out for months. Judging from the photos, the production model will closely resemble the showcar presented at Frankfurt. The exterior mirrors have been slightly revised, but the most noticeable change is the taller ride height. This is likely to be a suspension travel extension applied to both axles to protect the hypercar from being damaged during transportation.